Aubrey Island holds an interesting place in our family’s memories. It was the first island we canoed past when we would have our annual visit to a rented cottage on Howe Island. It was also the place where Martin fell off the boat, as we were docking for the first time in our 17 foot Siren, Katie. Sometimes, if the wind is very still you can hear the cows mooing over the 40 Acres in Brakey Bay on Wolfe Island. There is a good deep-water dock on Aubrey’s east side, a sheltered bay with docks on the south side, and two main picnic areas plus campsites on the island. Over the years, we had happily stayed on Aubrey, it always seemed to be our shelter in a storm. 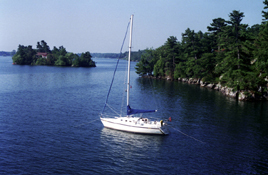 Once again, we set off in July for our annual the Thousand Islands adventure. We had had an exciting time the previous summer on Aubrey, our first adventure on our ‘new’ 1989 25 foot MacGregor. This year we were happy to find the dock on the popular south side of the island empty when we motored in. Having learned a few things over the years about Island Etiquette, we tied our boat up so our stern was at the very edge of the dock. The four of us were checking out the new composting toilets and buying fire wood from Mark(ie) the Park(ie) when a nice middle aged couple walked past the camp hut. They smiled and exclaimed happily, “Look at the dock space here!” Brooke asked hopefully, “Are you looking for a spot for your sailboat?” “No, we are here with three houseboats and eight teenagers, this looks perfect!” With that the couple retreated down the path to gather their houseboats and converge on the Island. The Parkie exchanged glances with us and I could not help but groan aloud, “Oh God.” I had visions of mayhem and madness and music-all the things I tried to avoid when on holiday. Of course, Capt’n Mike and Martin were thrilled that other people would be joining us! I lit the Coleman grill and heated up a fabulous lunch for the kids, under the shelter of the camp hut. We watched as each Houseboat pulled up to the long dock, tied off and then went to help the next vessel. When all the boats were settled, one of the Captains commanded, “You can’t drink until you run!” From behind our blue porcelain coated metal mugs steaming with hot chocolate we watched, in amazement, as the ‘crew’ of the houseboats ran laps around the island. This was not the type of behavior I had expected! I happily anticipated another Thousand Island adventure. The day unfolded as so many Island days do: eating, fishing, eating and now it was time for our nightly campfire and S’mores. Martin wondered if he could invite our new neighbors along. Off my little sunny Jim went and offered to share his campfire and treats. Soon the hut was filled with laughter and we learned that the house boaters were all cousins and brothers and sisters and that this trip had been two years in the making. They shared their memories of years of family trips to the St. Lawrence Islands National Park and I felt proud to be sharing my family with theirs. With that, Martin climbed up onto a picnic table and began playing his favorite Pink Floyd song, his cousin Michael had just taught him “Wish You Were Here.” As he strummed the first few cords, music filled the hut and the crowd called out approval for the song they recognized. Soon everyone sang along and lit lighters while swaying to the melody. It was a small crowd, in a small hut, on a small island and the biggest concert Martin had ever played. That evening others played that Martin guitar and songs were sung. As our new found friends were leaving they exclaimed “He is a great for a 12 year old!” Martin beamed with pride – he was ten at the time.